Every month and day or week, for that matter, has now been claimed by some kind of group or cause. In an attempt to bring attention to important causes, ideas or illnesses we have labeled all as 'something.' April has long been known in the book circles as National Poetry Month. It's quite possible, I think, that a once good idea has very little traction in the wider world. This is a very small sample size, I admit. But we had very few readings in April due to the fact that my wife was due to have a child on 4-17-10. We have a small staff and I didn't feel like setting up lots of events was fair to the rest of the Micawber's crew while I was not going to be working. I expected a lot of criticism and backlash from this decision. The result, in reality, was crickets. Nothing. I'm not certain what to make of this. It could be any number of things. Authors and publishers respecting my need for some time with my family. Or that there were poetry events taking place elsewhere. More likely, though, is that this month doesn't drive poetry sales like it once did. And before the poets and poetry-lovers start to hate on me--just listen to what I have to say. I might be right or I might be wrong. There are bookstores who still specialize in poetry. Grolier, for example. Other than those who specialize, poetry has become a very difficult category for general bookstores to deal with. You want to represent a wide variety of voices and styles. Often the money does not follow those desires to do right. And, ultimately, no real bookstore can sustain any category that does not carry its weight. Having poetry for the sake of poetry might be noble--but it can also be foolish. Any retail establishment is not a gallery. It is a venue to sell some product. My main thought is that there are too many awards now. Readers see a sticker or tag on a book and no longer pay attention to it like they once did. The awards mean almost nothing. There are simply too many. This might be a post that holds more interest for other buyers and indie stores as opposed to the general reading public. But what does National Poetry Month mean for stores right now? And does it make sense to display large numbers of volumes of poetry that do not sell? Billy Collins, Mary Oliver and Pablo Neruda are the three biggies that sell, I'm guessing, most everywhere. Outside of them it becomes a game of locality and strong reviews. So, tell me people, what this means in the grand scheme of things. Because I truly do not know. Just so I don't seem like a total nay-sayer I want to post an image and idea about the one book we're selling very well. 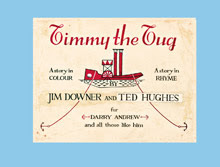 "Timmy the Tug" is a gorgeous book that is set for both adults and children. Thames and Hudson did a fabulous job with the package. At $19.95 I think it is a steal in terms of content and design.